On the edge of the Serengeti, in the Ngorongoro Conservation Area (NCA), we had the extreme luck of a male lion traveling straight at us at a brisk pace at sunrise. 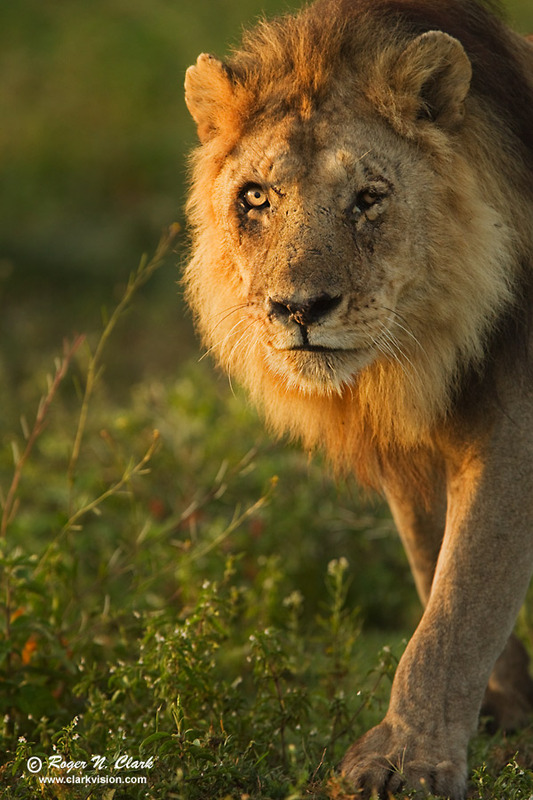 This lion was in a recent battle that left the left side of his face swollen and partially paralyzed. His eye looked like it might be Ok, but was deep in the swollen face. The battle was recent as when he passed by, some of his wounds were quite red. I got as low as I could get to match eye level with the lion. This image was taken when the lion was at a distance of about 12 meters (about 39 feet). The lion passed us 7 seconds later at a distance of about 3 meters. Camera data show that the lion was moving at 1.7 meters per second (3.8 miles per hour). Canon EOS-1D Mark IV camera, 300 mm L IS lens + 1.4x TC = 420 mm at f/4, 1/1000 sec, ISO 800. Full image, no crop. AF sensor placed on eye at rule of thirds line. Autofocus in AI servo mode to track the approaching lion.